Employee onboarding is a tough nut to crack. After writing a blog post about three companies who absolutely nailed it, we realised that we still had a thing or two to learn. Right on cue, the opportunity to sort this rolled right in: Jams, our first company hackathon where we leave the office and work on whatever project we want. By the end of it, we had a Spotify jukebox, a print newspaper and, of course, a brand spanking new welcome centre. Here’s the story of how we transformed our employee onboarding in two days. Usually, employee onboarding is done with a mixture of verbal instructions, emails and PDFs. We wanted something less messy: one stop for everything a new hire needs to learn in their first week. That’s why we moved all of our documentation to our knowledge base. We wrote up our documents into simple, short articles and put them into a single category. By keeping everything in the same place, we’re ensuring our onboarding process is organised and always accessible. It was tempting to mark all of these flashy new articles as mandatory reads, but we decided it would be better to mark just one article as mandatory: Welcome to the team. 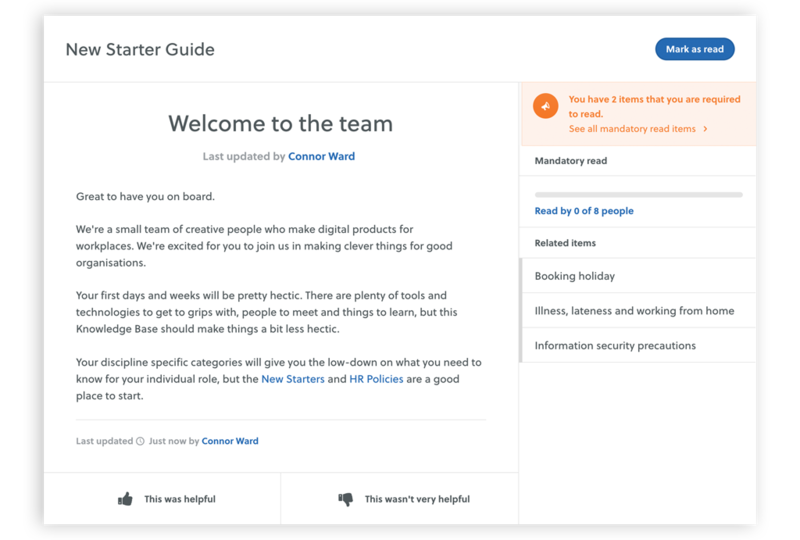 It’s a short introductory article that welcomes them and links to useful pages in the onboarding centre. We don’t all work in the London office – we’ve got team members spread across New York, Naples, Barcelona, Bristol and Sydney. 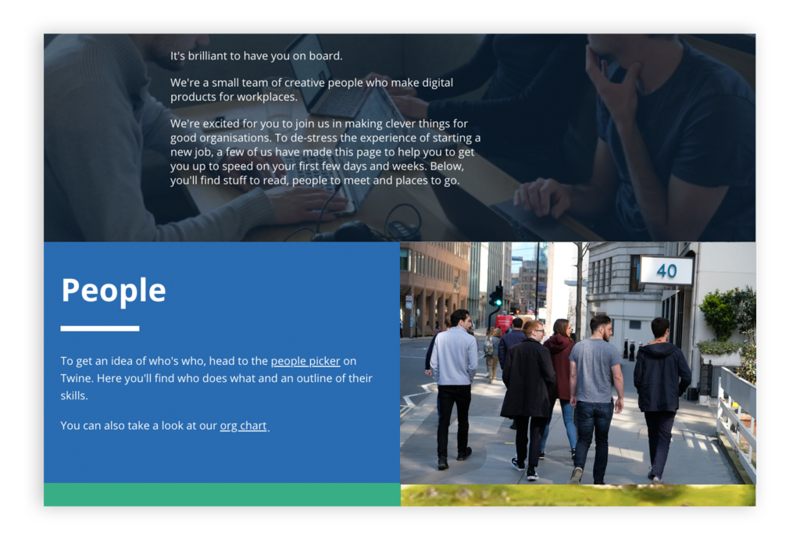 That means a new starters first introduction to some will be through Twine’s People Directory. We needed to bring that up to scratch. Each of these was added as a custom field in Twine and marked as mandatory. 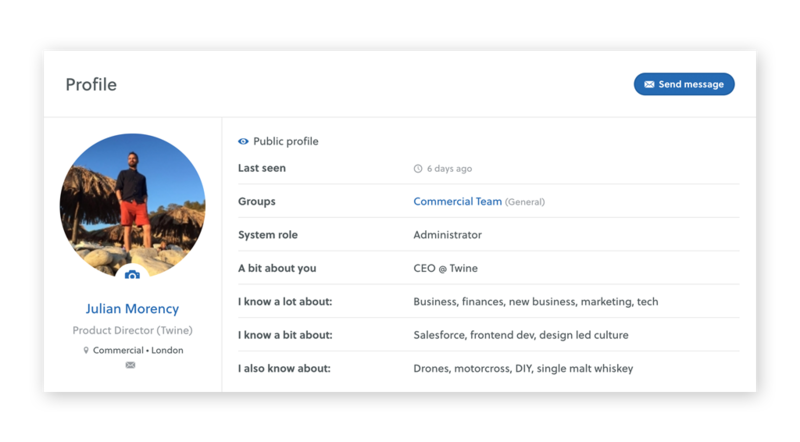 It added some much needed personality to our people directory and proved great conversation starters for existing team members. It helped that most users took a tongue in cheek approach (think: “An above average knowledge of local restaurants”, “Useless trivia”, “Old World Wine”). We realised that they would only get to see all our great content on their first day because that’s when they’d be given their login. But what about the days before they’d started? We wanted a short, simple introduction, so we built a welcome site. It’s a quickstart guide to the company. We kept the tone and content playful as we needed it to be a primer for our company culture. It’s got a few links off to external resources, including a map of the local area with our favourite haunts. This project was only the beginning. Since then, we’ve had an even longer think about our onboarding, and we’ve decided to share what we’ve learned in The Beginners Guide to Employee Onboarding. In it, we walk you through how to run an onboarding program from start to finish.